My research interest spans from interdisciplinary trends related to narratology to stage craft and the socio-political binaries with regards to theatre. I also tend to dabble in Miltonian narratives, pointedly armed with a posthumanist lens along with questions related to the innate study of the self. At present, I am invested in interdisciplinary strands related to English literature and theoretically, the post-postmodern (or as I like to call it, postmortemism), the absurd and the technological sciences. 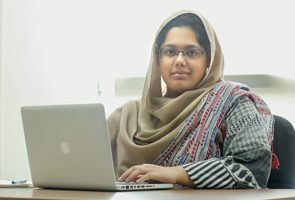 Having studied an M.Phil in English from Kinnaird College for Women, Lahore, Saira is presently employed as a Teaching Fellow in the School of Humanities and Social Sciences in Information Technology University. Before embarking on a teaching expedition at ITU, Saira Salman was a freelance writer and beta reader for various publishing websites. She was also a trainee pilot at the Lahore Flying Club.